My office is open on both the Friday before and the Monday after Easter; however, each of us can choose to take one day off as an office holiday. Good Friday was clearly the day that most of my coworkers picked, as there were only 4 of us in the office all day, but I think that those of us who came in on Friday had the better end of the deal by taking today off. Last Friday was one of the quietest days I’ve ever had at work. It was perfect for being productive, as well as for bonding with my coworkers, since we were able to eat lunch together around the lunchroom table. By the time we all left the office on Friday, everyone was in a wonderful mood, enjoying the weather, and looking forward to a long, holiday weekend. I celebrated by coming home and opening a bottle of the Shiraz. The 2003 Carmel Kayoumi Shiraz (winery, snooth) was made with 100% Shiraz grapes and was a dark ruby color with flecks of garnet. On the nose, there were blackberries, cedar, smoke, leather, and a touch of coffee. In the mouth, there were blackberries, plums, cooking meat, smoke, and ground coffee. The wine had high acidity, high tannins, and a medium body. Is this worth a glass after work? Sure…you won’t be drinking anything out of the ordinary, but you’ll have a decent, reliable glass of wine. 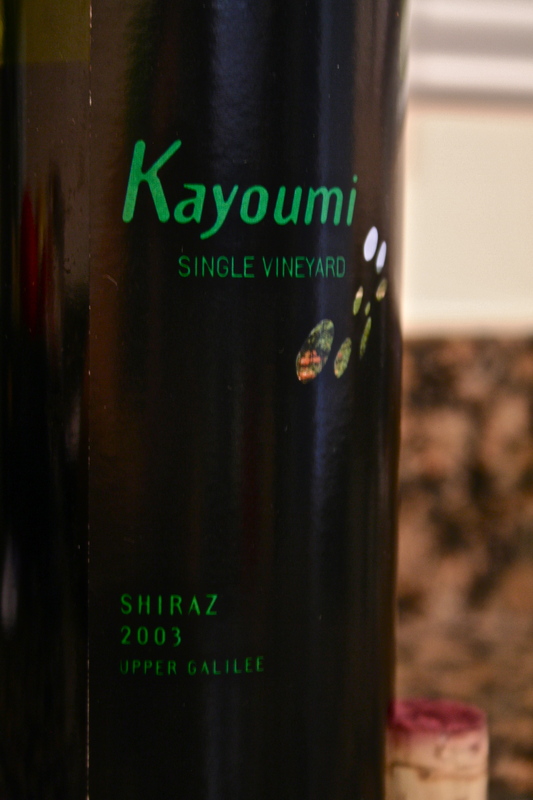 At $33, this kosher Shiraz was enjoyable both on its own and with grilled chicken I made for dinner. It was also the wine that I used to make my charoset, which is chopped apples, ground walnuts, cinnamon, and wine. The Kayoumi Shiraz mixed nicely with the other ingredients and resulted in a delicious addition to this year’s Passover celebration. mmm. Very nice, thanks for the review! Alleigh, I’m thrilled to have discovered your site. So nice & clean. I discovered it as an advocate of Israeli wines, but more specifically, as a lover of the wine in question. I get amazing bacon notes from this wine. Though throwing lots of sediment, I think it is a treat to find an older vintage like this on the shelf.